While I want to talk about the entire episode, because duh, sometimes there’s a thing that happens on Criminal Minds that is so monumental that it eclipses everything else that occurs. That was Wednesday for me, and for every other Jeid shipper that has been rooting and longing for a JJ/Reid pairing, forever. I always felt it started at the beginning. Her cutting him the first slice of his birthday cake, Gideon giving him those Redskin tickets, the subsequent sort of disaster that was ‘the date’… I was a goner. Since the beginning, we’ve been told no, won’t happen. Well this time something did. JJ admitted she’s always loved him. Always. Loved. Him. This is a paradigm shift for Criminal Minds fans, even for us who feel we’ve always known, always seen it. JJ has been there for every important event in his adult life. She’s seen him grow from a self-conscious, awkward young genius, to a confident, noble, and self-assured man. She’s seen him through drug addiction, an unearned prison stint, life-threatening injuries that left him physically scarred, and personal losses and crises that left him emotionally and mentally hollow. For his part, Spencer has watched her grow from a savvy media liaison and crack shot, to an expert profiler on par with any of them. He has had her back through countless life and death situations, the birth of her sons (his godsons), her abduction and torture, and forgave her role in the cover-up of Emily’s “death”, that nearly shattered their rock solid friendship (where he went to JJ’s home for ten weeks, every night, unable to cope with the loss alone), and he has literally saved her life. They have called each other “best friend” for a long time. Many years. And now for the first time we fans have hope that they may call each other something more. We don’t know if the show will allow them to act on this revelation, but many, many of us fervently hope that they do. Some of the most loving and passionate relationships are rooted in unshakeable friendship, first. Some fans didn’t ever see the fire between them, and were vocal about expressing their dissatisfaction. The most oft-used objection was “She’s married, with two kids.” I understand that sentiment, and the commitment, and what it means. I do wish those complaining understood our position as generously. However, with all due respect, and if I can be frank… so what? People aren’t carved in stone, and marriages end all the time for any myriad of reasons. Even though I hope they never villainize Will as a convenient plot device, because I like him and he doesn’t deserve it, that could still somehow happen. Or he could die in the line of duty, or they could split amicably, or there could be a big and messy legal fight. While I know from experience that children are resilient and can and do get over divorce, their well-being is of prime importance, and must be taken into consideration, even within this fictional family. What I definitely do not want to see, is the show’s writers parsing the meaning of the word “love”, as if she didn’t mean it romantically. The eyes told all, guys. We know exactly how she meant it. Please don’t insult us with an Obi-Wan retcon. To me, JJ’s marriage has been one of convenience, co-parenting, and great fondness. She turned Will down four times before finally accepting, after he had a near-death experience that shook her. Then she found herself spun into a well-meaning but abrupt wedding ambush, courtesy of her mother and Rossi, and all of a sudden, there it was. Her second pregnancy seemed to entrench her in the relationship, and Will has been a good husband and father. JJ accepted the trade-off of deep passion for security, and she’s never owned up to otherwise (“We make it work”). Until now. We really don’t know if they will follow up with a breakup. They could very well decide to push through with the status quo, though I highly doubt the writers would tease us with such an earth-shaking reveal and not pursue it one iota. Noting that there will be about a six month time jump when the show picks up again for the 15th and final season, what happens in that six months could be the key to moving forward. I can’t wait to see, and am greedy now for more episodes. I daresay that’s what the PTB were counting on when they planned this out. I’d be remiss in not mentioning Rossi and Krystall’s lovely, demurely elegant wedding (although, where were all her friends?). It was warm and sweet and Gail O’Grady is such a sincere, pure actor, I loved it. Nice to see Joy, ALSO JOHNNY MATHIS! I must also mention Matt and Kristy’s news, that another gorgeous Simmons wee one is on the way. Damn, those two are a fecund pair, aren’t they? And the happy BAU dance party was alive with the spirit of Penelope and Luke, while the wonderfully sardonic Tara had all the funniest lines (as usual). I have to apologize to Erica Meredith because I’m sure she worked so freaking hard on the UnSubs, the crime, et al… and the actors were all superb, especially the final UnSub and the judge. BUT I really cannot write coherently about anything else but JEID, probably for some time. When you’ve hoped, dreamed, written about, and fangirled about a ship for the past 14 years, and they finally make a move to canon? Pretty heady stuff. Especially when it’s handled with such love, class and dignity, from all involved, as well as both actors, especially. ← Criminal Minds Season Finale 14×15 “Truth or Dare” Promos and Pics! I love how you lay out all the reasons why these two would make sense together, and all the history they’ve shared that led to this point. I also love the choice of pictures throughout :D. Yeah. Definitely can’t wait to see what could come of this. 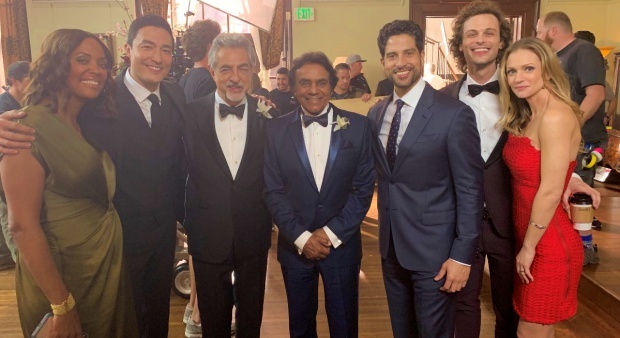 Agreed on Rossi’s wedding, too-it’s always nice to see the team being able to do something fun and joyous and cut loose for a few hours for a change. And I’m really pleasantly surprised at how they’ve developed the Rossi/Krystall relationship. Funny how a couple who had a quickie marriage so many years ago has managed to develop a much more mature, thoughtful one now. Time was good to these two, and their relationship is proof of that. To a long and happy marriage! Simmons and Kristy constantly having kids makes me think of the bassist of one of my favorite bands, who’s got, like, six kids :p. I couldn’t even begin to imagine raising that many children at once, but more power to the Simmons family for making it work. And yes, I also love how Tara and Luke have developed this snarky, “tell lame jokes” type of friendship. They’re really fun together. As I’ve said elsewhere, I’m just happy to see you happy, and I’m glad to not be alone in being excited about this. One potential upside to the fact we’ve got a while to wait until the show returns is that it could allow for an opportunity for some of the initial shock and anger and whatnot to subside, so if that happens, hopefully some people can look at this whole development with Reid and JJ in much calmer terms as a result, and perhaps be willing to see how the storyline plays out, whether or not they’re into Reid/JJ. Either that, or, if they don’t give a damn whatsoever about the whole Reid/JJ thing, hopefully they’ll still be willing to watch the final season in order to see how it wraps everything up in general, as well as what happens with the other characters. We shall see, I suppose. Anywho, I enjoyed reading this review :). I hope the show takes your wishes into account, not just in regards to Reid and JJ, but with everyone and everything else surrounding this. And I hope those who aren’t into this storyline and pairing can at least understand why you feel as you do, too. Thank you, as always, for your thoughtful post. I too hope that some who aren’t in favor of this pairing can at least come to see the potential from a storytelling standpoint, and understand that this happens all the time in real life. You’re the best! Great article Tari. Though I have never been a massive Jeid shipper myself.. 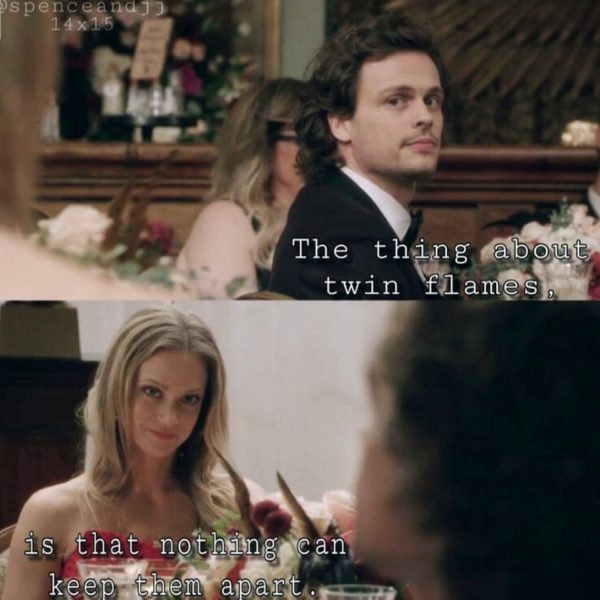 I have always seen the connection between Spencer and JJ. Thinking back through the seasons I have seen signs that there is something deeper between them. I always thought that the marriage to Will was more a convenience. If AJ hadn’t got pregnant in real life I don’t think that Willifer would have happened. I have never seen that much chemistry between those too compared to the caring and often, now I think back, longing looks between her and Spence, more so as the seasons have gone on. The prison stint is when it was confirmed to me when she showed JJ that picture Henry drew of Spence and Henry in the park. I got the feeling from Spence of longing … And the way JJ was looking at him too. I feel that the anger he felt at JJ over Emily was more profound towards her than Hotch and Emily because of his feelings for her. There are just so many signals out there. I just hope that they treat everyone including Will, I do like Will just never truely bought the Willifer relationship, with the respect they all need and they do not turn the final season into a soap opera. I look forward to seeing how the two characters deal with the revelation. I wish we had more than 10 episodes to deal with this as it won’t work itself out in just the couple Erica says it is gonna be dealt with. We need a Jeid spinoff lol..
A Jeid spinoff is an AMAZING idea! I also wish we had more episodes to work through this, but am dying to see what they make of it with what we do have. And YES, there have been so many signs along the way… I’m just so glad we finally got to hear those words. LOVE it so much! Love your thoughts and theories! I’m so conflicted and shocked. That tells me how well written and acted this episode was, how invested in these characters I am, and how great this show is. Seriously can’t wait to find out what happens! Devastated it will be the final season. It WAS really well-written and acted, wasn’t it? 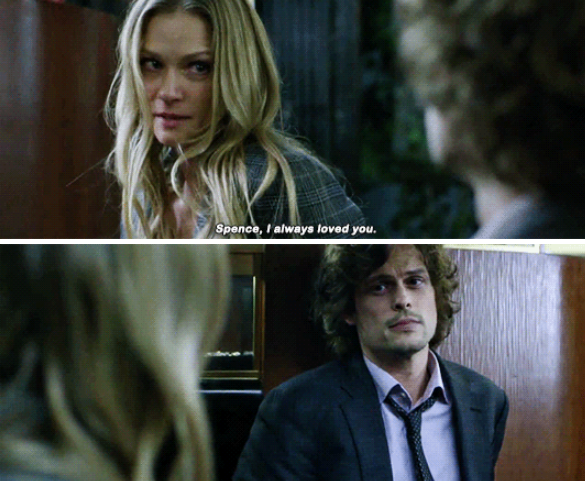 Loved Reid’s initial shock, JJ’s tearful then wary demeanor, not wanting to push, wondering how he felt… then Reid so gently making it okay for her at the wedding. The way he looked at her when she walked away… GAHHHH! I love everything you said! I have always wondered about their relationship, especially while he was in prison. She was so worried about him. I really didn’t know how excited I was about them until she admitted she loved him. I’ve watched the episode 4 times lol. I do love Will but I agree I think it’s a marriage of convenience and respect. He loves her and she knows he’s stable and a good man. Reid has done a lot of growing in the last few seasons and I think they are both ready for this step. I do have a fear it will be a common understanding of, if things were different in their lives but I’m really hoping not. It’s been 14 years of love, respect and friendship now they and us need more. I want her and Will to part amicably and her and Spencer to try and see where it goes. I can’t wait for next year! And so for the last couple years, I’ve been all for it. I’ve seen all the things you’ve mentioned in your commentary. I’ve looked back on past seasons and realized “yeah, there’s a little something that’s been there for a very long time.” I’ve seen the looks between them and they’ve made my heart swoon. 300 really solidified it for me. The way they looked at each other? The way Reid reflected on JJ asking him to be Henry’s godfather? My heart! It’s no secret that he’s adored her for years. My inner fangirl went CRAZY when they released the promo photos for episode 15 and we got the JJ/Reid photo from the wedding, and even more so when we got the promo itself. I wouldn’t shut up about it. I even managed to get my mom, a less enthusiastic CM fan, on board the ship. I started joking about the writers making JEID happen, longing for it, but always assuming they’d never go there as I tried not to get my hopes up too high. I was happy with quality JJ/Reid content, even if I knew it probably wouldn’t amount to anything. To say that I am in love with this episode would be an understatement. I imagine it will be months before I stop thinking/talking about it. It’s like I’m still in shock, and I can’t stop grinning like an idiot about it. Anyway, I am right there with you! I love this, and I can’t wait to see where they take it, even if it means the end result isn’t exactly what we want. It’s a beautiful, compelling story and I am so on board for it. I can certainly understand the different perspectives from fans, but the level of hate since the episode aired has been disheartening. Love is tricky, and messy, and complicated, and certainly not always fair. I think what the writers have given us is something that happens all the time in real life, and I’m eager to see how they unravel the fallout in the final season. We have to give them a chance to continue the story before we jump to conclusions about where it’s headed. And so, I tip my hat to you for inadvertently introducing me to the magic of JEID through a random post in the past, and for your enthusiasm for such a beautiful love between two beautiful fictional people. I’m thrilled for you, (and the rest of us who wanted this! ), whether we’ve wanted it for 14 years or only recently. BRING ON SEASON 15! You wrote everything that had to be said about our beautifull and dreamen couple JJ/Reid. I’m so excited because JEID is real. I cross my fingers so that Reid and JJ can finish as a couple, and for Will’s character to be cared for with respect by the writers. Honest to God, I had NO IDEA that JJ loved Spence! How didn’t I see it?? Watching the season finale of season 14 with my daughter, we looked at each other, mouths agape, before squealing like school girls lol! Again, how did I not see it? Can anyone list all the signs? Or all they remember? Maybe it will jump out at me then. I had to cancel cable again (😩) but I bought an antenna which gives me Ion channel. And Mondays and Tuesdays they play CM all day and night (except from 2am to 6 am) so I have been religiously 👀 looking for signs. Thanks everyone for your comments and thanks to the original author for this post!